How frustrated must you become before you resort to nasty letters and angry attitudes towards your late paying customers? Large and experienced AR departments often have a solid policy in place to help with invoice collection from late paying customers. The staff has been carefully trained to remain calm. They have several arrows in their bow to deploy in a potentially inflammatory situation. Not so for small business owners, collecting on your invoices is just a small part of your many responsibilities; you are simply wearing too many hats! And this can be a drain on your time and your patience. All of the above suggestions most certainly are valuable pointers to timely payment, but I would like to expand upon a couple of the suggestions. It is more than just a fast interaction with your customer to deal with overdue payments; it is imperative that you establish a rock solid policy for payment collection. Let’s establish how to get paid in 30 days if your contract says you should receive payment in 30 days! One great tip is to clearly define your surcharges imposed for late payment and make sure you impose these charges if you need to. Remember I mentioned the importance of great customer relationships? If you are waiting for payment, don’t assume you are in the right and your customer is in the wrong. Initially ask for an explanation, it may be that there has been a hold up in the approval process and getting mad with your point of contact will be no help at all. If you need to compromise, make sure your customer understands and accepts the new terms, but keep on top of the situation. Above all, learn from your mistakes! Seriously consider if it is worth continuing to do business with customers who continually neglect to pay your invoices on time. 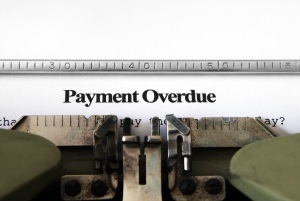 Don’t restore credit terms unless your customers have demonstrated consistent on time payment. Enforce your payment terms and don’t waver. A great way of improving cash flow is to factor your invoices with us at Bay View Funding. Invoice factoring converts unpaid or overdue invoices into cash, raising money on these accounts receivables and advancing cash quickly against them. Most relevant to this post is that Bay View Funding can manage your accounts receivable and receive timely payment on your behalf. Some delays in payments, such as extended payment terms, cannot be fixed so easily. Long payment terms are often a result of supplying to large corporations. Don’t impact your ability to grow because of late payment issues.